The AILabLinx™ module takes the headache and tedium out of transferring laboratory results from your lab equipment to the patient’s record. 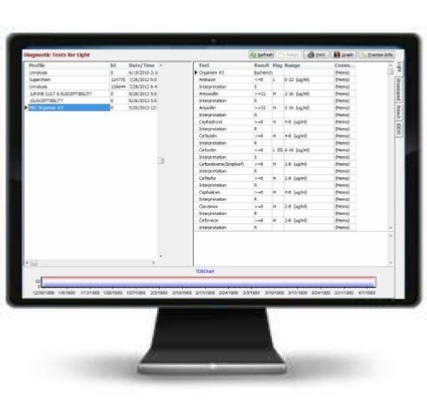 Using AILabLinx™ permanently places laboratory results in AIGalaxy™ or AIGenesis™and allows you to review tests for accuracy and then store them in the patient record. AILabLinx™ can monitor multiple in-house laboratory devices from different companies simultaneously,all on a single PC. AILabLinx™ can also easily be connected to external online reference laboratories, such as ANTECH® or IDEXX , so that you can eliminate tedious downloads and manual entry. Results can be viewed from the AILabLinx™ tab and the patient’s medical record in the Operations Center from any workstation. Results can show graphing and tabular type results for multiple time periods and further detail. This integration will make it possible for your clinic to easily connect to the ANTECH® or IDEXX reference laboratories, giving you the possibility to send requisition orders straight from your computer. Results will automatically be returned from ANTECH® or IDEXX, populating your patient’s medical record with the necessary information so that you may accurately treat your patients. While AILabLinx™ can allow you to go paperless, standardized reports can be printed from the AILabLinx™ tab or the Graph Laboratory Values viewing screen. Because AILabLinx™ enters results directly to the patient record, laboratory communications to referral sources or clients are easily created automatically. AILabLinx™ allows up to three sets of related values from the same analyzer to be compared on a graph for review at a glance. The doctor can then view trending by comparing results over time, not just same results, but multiple results! This helps make your diagnostic process easier to see trends.